I got an envelope in the mail the other day from Chris over at Nachos Grande. I had claimed a random Astros card a while back and I think he grew tired of it sitting there on his desk, so he graciously packaged it up and threw in a few extras for the hell of it. I've got a return PWE on my desk for the next mail box run with his name inked on it, so get ready Chris! Here's my side of the loot! How about that Custom A&G likeness? Awesome /10 custom auto from the man himself. I'll never argue with a Nolan Ryan being sent my way. And in the top left is the card I coveted, the John Hudek silver signature from UD Collector's Choice! Back in the day before fancy numbering and limited edition refractor craziness, these silver and gold signature parallels were some of the best inserts there were! Thanks Chris! If you feel I owe you something or you've been waiting for something from me and you don't see your zip code there, let me know! I want to make one big run to clear out all the stuff I owe to my friends out there, and I know I've been negligent lately with getting things out timely. I'm trying to get better about it, I promise!!!! 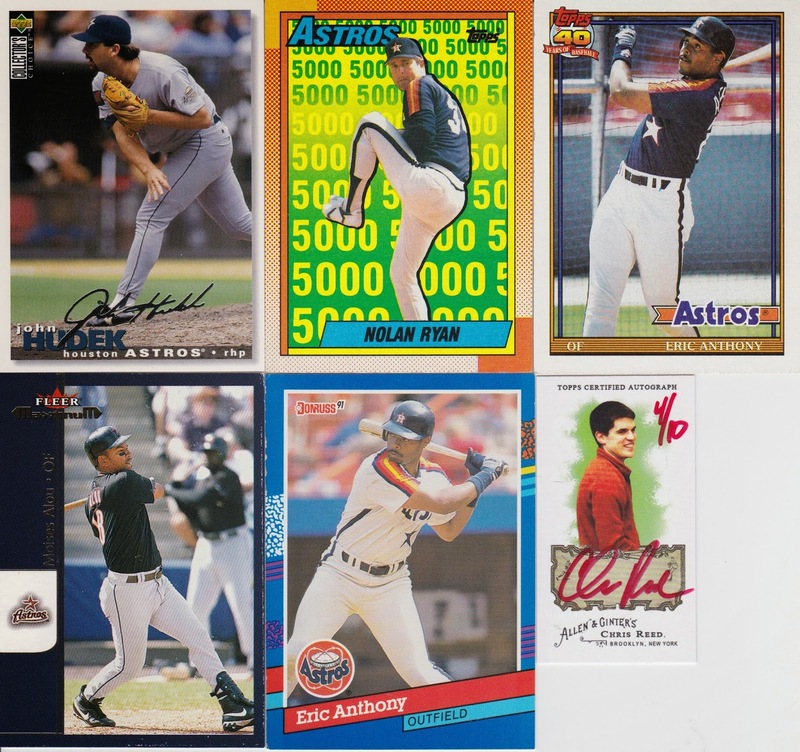 I always liked that 5000k Nolan Ryan card. That Reed custom is sweet! Sent you my new address.